The protagonist of this adventurous MD&G issue is the bassoon. During the 19th and 20th-centuries bassoon technique made rapid progress. Additional keys enabled the expansion of the instrument's tonal range and facilitated chromatic playing. Innovative expressive sound worlds opened up, and composers, particularly French ones, made frequent use of them. It is mainly for this reason that the compositions of this recording very often find their place in competition programmes. The bassoon's nasal cantabile tone, sonorous sound and frequently mischievous sophistication has always made the instrument a favourite with French composers, and this issue highlights some very exciting 20th-century Gaelic creations. Crazy runs and gripping rhythms punctuate Eugène Bozza's "Nocturne-Danse', while Alain Bernaud's "Hallucinations' shows the path to the extreme expressive regions in store for us. Pierre-Max Dubois takes us on an excursion into sultry decadence in his "Sonatine-Tango'. Jean Françaix's "Petit Divertissement Militaire' joints together intelligent playing wit and a strong dose of the grotesque, and Roger Boutry's "Interferences' utilizes the whole palette of instrumental key technique. The sonatas of Camille Saint-Saëns and Alexandre Tansman continue to be attractive, and are considered classics in their own right. The justly famous "Concertino' by Marcel Bitsch has the reputation of being a true pearl of French Chamber music, and all music lovers are unanimous in hailing it as the stuff of which dreams are made of. 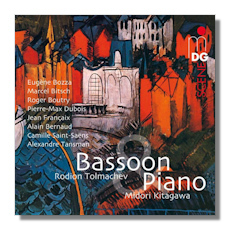 Rodion Tolmachev is, maybe, the foremost bassoon soloist at present, and he certainly delivers some astounding performances. Indeed, his expressive tonal nuance and breathtaking virtuosity are the hallmarks of these renditions and his passionate advocacy for the instrument allows this rather underrated member of the woodwind family to shine with possibilities. Midori Kitagawa gives sympathetic support. A highly intriguing disc which will surely please aficionados of 20th-century music, but those with more traditional tastes should find much to enjoy. Sound, notes and presentation are in the best MD&G tradition. Copyright © 2012 by Gerald Fenech.